BNIConnectGlobal YouTube training video site. LOTS of valuable training here to help you optimize your back-office web resources. Over the course of 8 weekly thirty minute sessions we are going to cover just about everything you ever wanted to know about BNI Connect. Really. Everything. No stone will be left unturned and no question will remain unanswered. 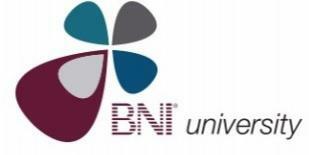 Join us for just the topics that interest you or become a BNI Connect guru like the support team! The first 6 sessions will concentrate functionality that should be accessible to ALL members. The last 2 sessions may require elevated privileges as a member of the leadership team. Once you register you will have access to attend all of the sessions but only need to come to the ones you want to. Feb 28 - Step 4: Visitors! Using BNI Connect to invite, register, track and follow up with visitors. Mar 7 - Step 5: For the numbers people out there - Reports! Reports! Reports! Each session is scheduled to be about 30 minutes of content and then open questions until every last question has been answered. The webinars will be recorded and the entire series will be uploaded to BNI University once completed. Remember - the only silly question is the unasked question! Here is a video about HOW and WHY to set up your User Profile from a local BNI member. Ivan MIsner has created a valuable series of networking videos: Enjoy!